So much to do, so little time. Sounds familiar? Consumed with life's daily hustle, we've now become reliant on the luxury of being able to get anything from food to movies (and even a car ride) at the push of a button. Instead of hiring concierge services or letting your interns pick up your dry cleaning, Mashaweer wants to get to your door first. Paying your bills or picking up lunch orders from restaurants? Done. Dropping off a visa at the airport? Sure. Surprise gift delivery to someone special? Check. It began with an idea- while on a trip to the U.S., Hani El Sherbini, co-founder of Mashaweer, and his brother-in-law and later co-founder, Ahmed Shabbara, tried a similar service and thought it was a great idea. 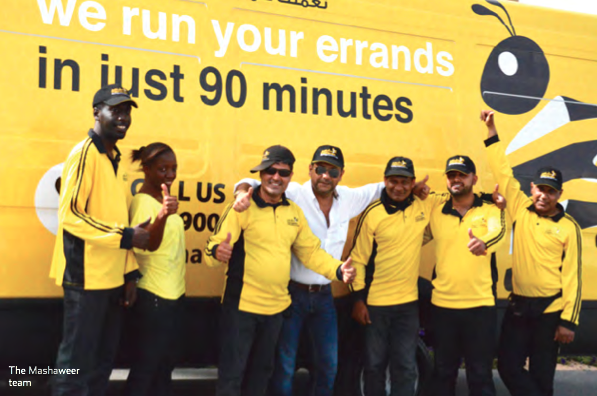 Time passed and when it still haven't caught on in the UAE, El Sherbini and Shabbara, decided an errand service company was the "perfect business" for the busy lifestyle of UAE residents, offering personal and business errands. With their idea ignited, the co-founders focused on the nitty-gritty of the concept. Their development and testing stage involved three main areas: software and systems, time, and people. "It was critical for us to perfect our software and systems to create a platform that is right for the company and this type of service," explains El Sherbini. It involved research and testing "till we get it right" on the best software and GPS platforms and tracking systems, as knowing the real-time location of their drivers' ETA to the destination was an essential part of fulfilling their 90-minute promise, and to schedule ahead of time. Time was a major element they also worked on to "ensure that every task, activity and job is done at the utmost level of efficiency and consistency." Involving a "bit of homework on routes and roads in Dubai, including distances travelled and time involved" was also important. However, the duo found the process of finding and training the right people -especially drivers- the "most time-consuming and challenging" aspect. Their services calls for licensed drivers who are extremely familiar with both Dubai and Sharjah. This was difficult because most experienced drivers are knowledgeable with one or two areas of the city, but unfamiliar with the rest. Their solution? "Over a period of three to five months, we had to undergo an intensive program to train all our drivers on every part of the city!" Another challenge they've encountered was awareness. Since the concept of doing errands as a service was still fairly new to UAE and the region, "getting the word out and making sure people understand what it is that we do was challenging", especially with a limited marketing budget that startups have and the diverse nature of the market in Dubai. Relying on friends and family and word of mouth, they decided it was the way to go as well as utilizing social media tools to "cost-effectively get the word out." With posts on quotes, funny comic strips and customer feedback, it seems they're quite savvy on Instagram, too. Explaining that they provide customer service through their social media channels, El Sherbini elaborates, "We aim to connect with potential customers as well as build relationships with our current customers. Mashaweer wants to be perceived as friendly, approachable, and trustworthy." 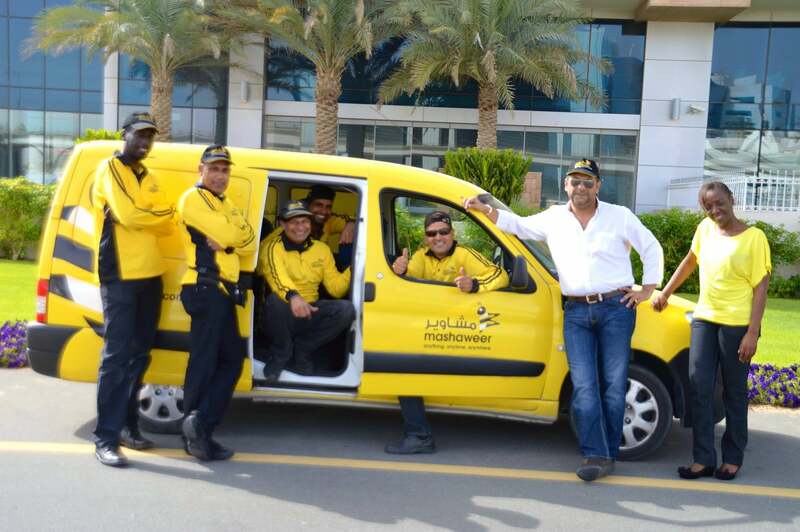 But with concierge services already present in the region, how is Mashaweer distinguishing themselves? "We also have a handful of concierge companies as our regular customers. We differentiate ourselves by offering a very flexible, non-rigid approach to customer service. We listen to our clients and do our very best to accommodate any request. Our goal is to become perceived as their very own personal driver whom they can trust with all their day-to-day to-do [lists]." One of the most important differences as well is that Mashaweer charge by trip and not by time, and they "entertain individual orders and not through monthly packages." Speaking of individual orders, in U.S. errand startups like TaskRabbit, users can run errands for others. Has Mashweer considered this feature? Although the duo would "never say never" to the idea, El Sherbini brings up the difficulty of "the legality and formality factor as well as for safety and security." Mashaweer is fully insured but these factors can "get quite complicated." El Sherbini brings up the selective hiring process that's essential for the "consistently efficient and quality service" they provide. Their long-term customers know and trust their drivers and El Sherbini asserts that just "like any great business, our people are our most important asset, and have been the driving force to our success so far." Co-founder Hani El Sherbini is a 46-year-old civil engineering graduate with a diverse background varying from project management to business development, as well as having an import and export business dealing with construction materials and foodstuffs in the GCC and African market. Co-founder 44-year-old Ahmed Shabbara brings on board extensive experience in logistics and operations from his background as an owner of a leading cargo and transport company in Egypt. "Placing an order with Mashaweer is very simple and our customers can basically reach us anyway they like. They can either give us a call, place their order online through our website, email us, send us a post on Facebook, Twitter- whatever way is most convenient to them. Once an order is registered, customers are sent a confirmation email with an order number followed by another email once a pick up has been made. Later, they will receive an email once the order/errand has been completed." "We are busiest during the week, but on weekends we get a quite a lot of deliveries involving special occasions and birthday party-related orders. Cheque collection and bank deposits are one of the very popular errands requested by corporate customers." "We have gotten quite a few random orders that none seem so strange anymore! From mums calling because one of the kids left their PE kit at home, to a wife wanting to surprise her husband who was visiting to Dubai on a business tip during his birthday and asked us to fetch some golf clubs from Al Quoz, and deliver them to the hotel where he was staying. We've also had requests to pick up impounded cars, send them to the impoundment station and pick them up again once the impound time has been completed!" "Our business model is simple; we provide a service with the sole aim of saving valuable time and resources of our target market, which includes people with busy lifestyles and corporate executives. We offer a solution to help individuals and companies save time, effort and resources by being their very own trusted partner who can take some of the burden off their busy schedules at very competitive rates." "We use a simple NPV [Net Present Value] to calculate our ROI. Based on our growth pattern we estimate that we will break even beginning of 2015, and we expect to sustain a double-digit growth every quarter thereafter. We have been operational almost three years and our growth is amazing on all levels, number of errands, customer base and sales figures. " "Our user base is split into individual customers and corporate clients. Almost 65% of our business comes from corporate clients and the remaining comes from individual customers. 70% of our total user base is female while 30% is male."